Christmas is the most glorious time of the year and Starbucks Philippines knows just that. Especially here in the Philippines, gift-giving is most prevalent during this season. With that in mind, Starbucks Philippines celebrates by giving good during the festive holidays. P.S. Read ’til the very end for the best gift ever. Last year’s blue siren and coffee stain designs introduced bursting colors to the coffee brand’s collection of planners. 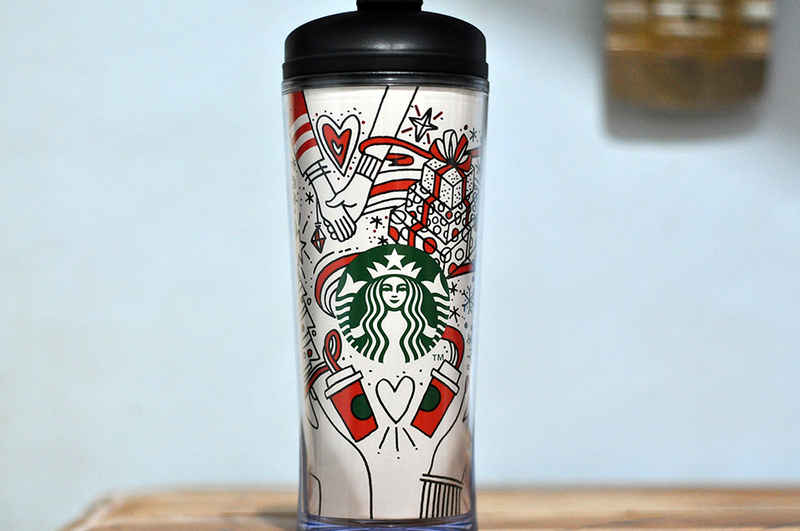 This time, Starbucks releases designs that highlight the Kape Vinta Card. We can choose from the blue and green hues reminiscent of the calm of the season and the warm pigments orange that is as festive as the card it frames. Encased in leather sleeves, both designs give off a classic look for the Starbucks staple item. Inside, there are plenty more surprises such as a stencil ruler and a cleverly-designed calendar that can be folded in a shape of a cup. All planner sets are available in regular and mini sizes. As early as November 2, Starbucks fans can already start collecting stickers to get their hands on the much-awaited planners. They get to choose from the three handcrafted holiday beverages to savor the flavors of Christmas. (1&2) Snowman and Holiday Tree cards. These are yearly fan favorites depicting wintery scenes using cool colors of silver, blues and greens. Available for an initial activation amount of ₱300 per card starting November 2, 2017. (4) Maligayang Pasko card. This one is another Philippine market exclusive. Celebrate Christmas the Pinoy way. Available for an initial activation amount of ₱300 starting November 2, 2017. (5) 2018 Red Cup card. This year’s Red Cup Card matches the physical Give Good cup and merchandise, and comes with a red Kraft sleeve carrier. Available for an initial activation amount of ₱1,000 per card starting November 2, 2017. One new drink and two returning favorites. Inspired by the classic nougat confection, this Starbucks Vanilla Nougat Latte is delicious with the rich taste of French vanilla (custard-like and slightly floral) and nougat notes. And what is Christmas at Starbucks without the favorite Toffee Nut Latte and Peppermint Mocha drinks? This year, they come with a twist though, and were improved with customer feedback in mind. Peppermint Mocha is now Christmas Tree Peppermint Dark Mocha! Imagine decadent dark mocha topped with green tea whipped cream and finished with glittering sprinkles of green and red candies, just like a Christmas tree when lit up. Toffee Nut Latte is now Toffee Nut Crunch Latte! This one’s toffee nut syrup combined with velvety steamed milk, espresso shots and topped with whipped cream and crunchy toffee nut crunch toppings. Yes, I typed crunch twice. The drinks will be available in hot, iced and Frappuccino formats (coffee-based and cream-based) starting November 2 (until supplies last) for P160 – short, P170 – tall, P185 – grande, P200 – venti. Here’s new and returning festive holiday food that will surely tickle your curiosity. To celebrate 20 years of Starbucks Philippines, they are giving back by giving good. In keeping with the Christmas spirit and the habit of ‘giving good’, Starbucks will start sending cheers with its biggest present to coffee lovers: Starbucks for a Year for lucky customers bringing home the Starbucks 2018 Planner. These incredible prizes are up for grabs for holders of the special edition Starbucks Kape Vinta Card, exclusively released with the Starbucks 2018 Planners. Customers simply need to activate the card with at least Php300 and register the card to a My Starbucks Rewards account during the promo period to earn a raffle entry. All raffle entries included from January 1-31, 2018 will automatically qualify for the Starbucks for a Month and Starbucks for a Year promo. plenty more of ‘give good’ news heading your way, so make sure to stay updated by following Libotero on Facebook or visiting www.starbucks.ph.